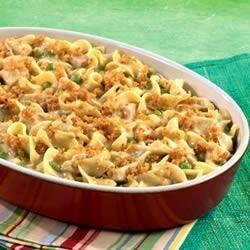 "Chicken, mixed vegetables, noodles and cheese are brought together in this rich and crowd-pleasing casserole." Stir soup, milk, black pepper, vegetables, chicken, noodles and Parmesan cheese in 1 1/2-quart casserole. Bake at 400 degrees F for 25 minutes or until hot. Stir. To Make Golden Onion Chicken and Noodle Casserole: Omit cheese. Use 1/2 cup crushed French fried onions. For Hearty Chicken Casserole with a Twist: Use 2 cups cooked corkscrew-shaped pasta for noodles. I loved this recipe, it was simple to make and my husband loved it. Just make sure to use a mild cheddar, sharp overpowers the flavor of the cream of mushroom soup! Not my favorite and the boys picked at it. Not bad to make but too many better recipes out there to try to fix it up again. Thanks though. I used a bit more veggies than the recipe called for, and I also topped it with bread crumbs. Awesome!